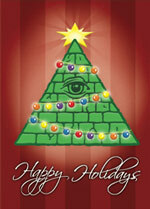 Daily Illuminator: Download Free Munchkin Holiday Cards And Gift Tags! December 18, 2018: Download Free Munchkin Holiday Cards And Gift Tags! It's time for the holidays, and that means it is time that we direct you to these free Munchkin gift tags and greeting cards. You may use these when preparing gifts for the Munchkin players in your life; all you have to do is download the PDFs and print each one on your home printer. A little cutting and folding later, and your free gift tags and greeting cards are ready for action! If you're looking for a less DIY form of Munchkin gift this holiday season, we have the Munchkin Gift Pack that includes three pre-wrapped Munchkin games and five Munchkin promo cards. This option isn't as personalized as the print 'em yourself gift tags and cards, but it's certainly a lot faster for the Santa-on-the-go. For even more Munchkin holiday joy, please check out this page at Warehouse 23.